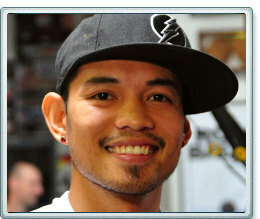 Can Nonito Donaire Earn Style Points? In a couple of weeks, a highly anticipated bout takes place between IBF/WBO junior featherweight champion Nonito Donaire and Toshiaki Nishioka (who held the WBC belt with distinction for several years) at the Home Depot Center in Carson, California (headlining on HBO). However, to many, that night’s main event will be the junior welterweight contest featuring Brandon Rios and Mike Alvarado. The reason is simple; that match-up is almost guaranteed to provide back-and-forth action. And to be quite honest, in his last 36 rounds, Donaire has won but hasn’t necessarily been scintillating. Yeah, he’s won convincingly (and picked up a couple of 122-pound world title belts in the process) but in bouts versus Omar Narvaez, Wilfredo Vazquez Jr. and, most recently, Jeffrey Mathebula, the respective audiences in New York, San Antonio and Carson got restless and you could hear a scattering of catcalls and boos during various stages of those fights. The manner in which Donaire halted Montiel, at the time, made him among the most buzzworthy boxers in the business. It also let everyone know: bring the fight to him at your own peril. Since then, those placed in front of him have counterpunched in a cautious and safe manner. At the world-class level, if a boxer wants to just survive and stink it out, it becomes almost impossible to score a stoppage. In his most recent fights, Donaire has almost had to fight for two men. Yes, it does take two to tangle (and make a fight). “It’s more for me trying to figure out and learn the process of being a better fighter, how to dissect a fighter who blocks and I have figured out how to do things that way now after facing guys who don’t want to engage. And so I’ve learned a lot from it. I think that it’s definitely an experience; that’s for sure,” said Donaire, who understands that he has to be a steadier, more consistent fighter in his own right and not just fight in spots. In other sports, winning - as Vince Lombardi once famously uttered - is everything. It’s the only thing that really counts. In the NFL, whether you win by a field goal or seven touchdowns, it’s all the same. Just think about it; it wasn’t just that Andre Ward beat Chad Dawson last month, it was the manner in which he dominated and stopped Dawson that really earned Ward the accolades he’s received. It left an impression. You wanted to see more. With Donaire’s recent outings, by the late rounds, you had had enough and wanted to move on. But that’s part of the deal; when you’re considered one of the best boxers on the planet, paid as well as he is and given the biggest platforms on which to perform, there is a certain expectation to deliver something beyond the ordinary. But can Donaire recapture that magic he had when he iced Montiel? In two Saturdays, if he doesn’t, what is sure to be a predominantly Mexican-American crowd at the Home Depot Center will surely let him hear it. If Rios-Alvarado is the fight Dennis Green thinks it is and we crown it as such, well, the pressure will be on Donaire to deliver a memorable performance. But he says he can’t do it all by himself. As for a Bradley-Berto clash, well, Schaefer was telling the likes of Lance Pugmire of the L.A. Times that he represented Berto and that he was also in possession of a November 24th date on HBO for a Berto bout with IBF junior middleweight champion Cornelius Bundrage. “We are holding Nov. 24 for a fight between Andre Berto and [Cornelius] ‘K-9’ Bundrage and Richard Abril against Sharif Bogere. That will be a tripleheader and we are currently working on the third fight as well and that’s with HBO,” he told Lem Satterfield of RingTV. This was news to Arum who said he had “no idea” that DiBella was no longer promoting Berto and had talked to him on Friday morning trying to consummate Bradley-Berto. Regarding Bradley versus Guerrero-Berto, as Aretha Franklin once asked, who’s zoomin’ who? Right now, it looks like HBO could be stuck with Berto-Bundrage and Bradley against either Ruslan Provodnikov or Lamont Peterson instead of the fight they really want. No doubt about it; both Schaefer and Arum will point fingers at each other. So I wonder, is it time for Ken Hershman clear the air on just what really took place, similar to what his predecessor at HBO did when Ross Greenburg admitted negotiations for a [Manny] Pacquiao-[Floyd] Mayweather fight had taken place in the summer of 2010 between the two sides when some claimed no talks had occurred? For now, what we have is Bradley and a stadium in mid-December. “We have done big events in Dallas in Yankee Stadium and I think we specialize in big events in ballparks and football stadiums and if we do this event in Miami, we hope to replicate it, “said Arum, who said the ownership of the Marlins pitched the idea of doing an event to Top Rank. If this comes to fruition, Arum says that Cuban Guillermo Rigondeaux would be on the co-feature. On Friday morning, word leaked out that Orlando Salido - slated to face Mikey Garcia on November 10th at the Wynn Hotel in Las Vegas on HBO - had injured his hand in a car door, therefore forcing him off that card. So what does that mean for Garcia, who has patiently been waiting for his title shot? This past weekend’s edition of “Boxing After Dark” was full of JAGs (as Bill Parcells would call them, for “Just another guy”) and suspects...It certainly wasn’t as eventful as this year’s BET Hip-Hop Awards: http://cdn.mediatakeout.com/58721/hip-hop-awards-drama-50-cent-gets-into-a-fight-with-diddy-rick-ross-gets-into-a-fight-with-jeezy-gunshots-arrests.html...Arum mentioned that Yuriorkis Gamboa (yeah, the guy who left Top Rank earlier and had Floyd and Fiddy pay a lot to get it done) could appear on the Pacquiao-Juan Manuel Marquez IV undercard on Dec. 8th...Reversing course, Stephen Espinoza of Showtime told me via email that they have purchased the Amir Khan-Carlos Molina bout and will place it on Dec. 15th (at a venue yet to be determined)...Seriously, did Hasim Rahman even train for his bout with Alexander Povetkin?...Can you believe Stephen “The Miracle Maker” Morris? He might be inconsistent but geez, he makes things happen for the ‘Canes...Right now, this is Geno Smith’s Heisman Trophy to lose...Is this the year Matt Ryan becomes an elite NFL signal caller?...The Jets are kinda bad...“Treme” doesn’t have a lot of frills but it’s a solid show on HBO?